Hoshruba is an exhausting delight. “It has consumed whole generations of readers before you”, warns the introduction to this volume, and while obsession is probably what was meant, used up works as well. My immediate feeling on turning the last of these four hundred and thirty pages of story, so remorselessly crowded with incident and imagery, was simply of being spent; and The Land and the Tilism is merely the first of a projected twenty-four comparably-sized volumes that will bring the complete work to the English-speaking world. (It is a mere five volumes in the original Urdu; but each somewhere in the region of 1,500 pages long.) Not necessarily in terms of the scope of the events described, but certainly in terms of their sheer number and duration, as an epic epic fantasy — for that is what it is and, lacking the knowledge to review it in its historical or cultural context, that’s what I’m going to review it as here — it knocks just about anything else you can think of into a cocked hat. Some background. (Shamelessly recycled, I should note, from that introduction, elegantly composed by translator Musharraf Ali Farooqi.) You should have heard of The Adventures of Amir Hamza, a chronicle of the exploits of the uncle of the Prophet Muhammad, told in India as part of the dastan genre of oral epics. It was first collected, and no doubt at least partly composed, in the mid to late sixteenth century, incorporating many pre-existing fictions and legends, at the request of the Mughal Emperor Akbar. By the nineteenth century, however, it had become somewhat familiar. As Farooqi tells it, a group of storytellers in Lucknow decided to liven up the story with “an injection of local talent” — meaning that they would introduce into the tale elements from Indian and Islamic fantastical and folk traditions, in particular magic and magic-users, to run alongside the existing Arabian and Persian tropes. But the new tales had to be indisputably part of the Amir Hamza cycle, for that was what audiences wanted, and were used to. The man who, in the mid-nineteenth century, probably came up with what can perhaps, crudely, be thought of as an unauthorized spin-off series (at least until authorization was provided by the approval of the audience) was one Mir Ahmed Ali. He seized on the defeat of a renowned enemy of Amir Hamza, the giant Laqa, as his point of departure. While Amir Hamza pursued Laqa, he decided, some of Hamza’s associates and relatives would find themselves entangled in events in a magical land; and these splitters would become the subjects of the new tales. By the time another Lucknow storyteller, Muhammad Husain Jah, was commissioned to produce the first (or first enduring) written version of the epic, the first volume of which appeared in 1883, Hoshruba had been a storming success for several decades. Jah’s books, on which the present translation is based, were best-sellers. So this is clearly a notable work. The set-up runs roughly thus: out on a hunting trip, one of Amir Hamza’s sons, Prince Badiuz Zaman, accidentally kills one of the guardian sorcerers of the magical realm of Hoshruba, and in consequence is imprisoned by Afrasiyab, the Emperor. Hoshruba, we are to understand, is an immense tilism, a place created by infusing inanimate matter with magic. Most tilisms (it seems) are modestly sized, and created for a specific purpose — enchanting some bandits and preventing them from attacking you, say. Hoshruba is vastly larger, divided into three regions (Zahir, Batin and Zulmat, the manifest, hidden and dark regions), to the point where it is capable of containing other tilisms within itself. Nevertheless, Amir Hamza launches a campaign against Afrasiyab, after consultation with his diviners reveals that one of his grandsons, Prince Asad, is destined to conquer Hoshruba with the help of five tricksters. (Central to this is the acquisition of Hoshruba’s material key: as with all tilisms, control the key, and you control the fate of the tilism.) Hamza’s childhood companion Amar Ayyar is called up as lead trickster and, before long, the interlopers are fomenting rebellion within Hoshruba. The bulk of this volume (and, I presume, the bulk of Hoshruba) details the wax and wane of their struggles against Afrasiyab. Now we come to both the delight and the exhaustion. To deal with the latter first: Hoshruba is, much of the time – and not terribly surprisingly – episodic to the point of formulaic, and thus predictable. Moreover episodes are short and numerous. There are some of what we might call arc elements, but Hoshruba is predominantly what Farah Mendlesohn has called a “bracelet fantasy”; there is no necessary connection between the overarching quest and the individual adventures that take place. You can have as many links in your chain as you want, and the most common links in Hoshruba’s chain are encounters with sorcerers or sorcerersses, summoned by Afrasiyab to deal with Asad’s rebellion. So for all his grand introduction, twenty pages later Ijlal has been outsmarted by Amar Ayyar, realized Laqa is a false god, and converted to the True Faith; after which I’m not sure we ever hear from him again. And that’s actually pretty good going for a magic-user in this book. Most have had their heads cut off before half that many pages have elapsed. Equally the book’s idiom, lavish to the point of hyperbole, can when read over a relatively short period become repetitive. Descriptions of beauty, in particular, suffer from diminishing returns. One princess is “the gazelle of the desert of beauty and a prancing peacock of the forest of splendour” (12); another is “an inestimable pearl of the oyster of love … the sun of the sky of elegance and beauty” (78-9); upping the stakes, of a third woman we are told that “no one had ever seen or heard of such splendour [no one who hasn’t read the preceding hundred pages, at least] … It seemed that her thighs were kneaded with powdered stars” (100); on the other hand, the beauty of a fourth “was so astonishing that even charming fairies were fit only to be her slave girls” (189), which seems almost mild by comparison. As viewed with contemporary expectations of a prose narrative, these characteristics can be tiring. Particularly in the second half of the volume, once the story is up and running, there is little sense of progress. There is no map of the tilism, and judging by the way various characters zip back and forth between different locations, it may be a landscape in flux, anyway. Individual locations – cities, mountains and forests, mostly – can be strikingly described, but aside from the over-arching tripartite division of Hoshruba, there’s little sense of how the various jigsaw pieces we’re shown fit together. Nor is there much character development; there are, evidently, a great many sorcerers and sorcereresses in Hoshruba willing to try their luck against Asad and Amar (the list of “characters, historic figures, deities and mythical beings” is a healthy nine pages long), and even those who are converted to the True Faith show little sign of the interior life we expect of characters nowadays. (Technically they are persuaded to pledge allegiance to the True Faith; magic, in Hoshruba, is the province of divinity, which is why the tricksters and other followers of the True Faith have none, and if Afrasiyab’s minions genuinely converted, they would lose their magic powers and be useless to the rebel cause.) Equally, Asad and, particularly, Amar are definitionally infallible: there is no suspense about the fact of their triumph, sanctioned as it is by God, only in the detail of how it is achieved. But that, of course, is the key to the delights of Hoshruba. Its pleasures are almost entirely immediate and local to whatever part of the story you happen to be reading: the detail of each individual adventure, or location, or character, and the constant arms race of tactics between Amar Ayyar’s tricksters and Afrasiyab’s sorcerers. The elaborately metaphoric idiom – “His mind dove into the sea of trickery and presently emerged with a pearl of thought” (110) – is to be revelled in, and is not without some self-awareness. (A list of Amir Hamza’s feared commanders includes Karit Shield-Whirler, Jamhur World-Conflagrer, and … Saif the Ambidextrous?) As is the narrative’s ludicrous casualness with huge numbers. Afrasiyab’s home base, an enormous tower called the Dome of Light, houses twelve thousand sorcerers on its first tier alone. At one point, there’s a passing mention of eighteen thousand princesses, which must be quite a family tree. And armies the size of Ijlal’s or larger are regularly disposed of in a sentence or two — this is, in one sense, the bloodthirstiest book I have ever read. Many cultural details, Farooqi notes – styles of dress for example – are drawn from the contemporary surroundings of those who originally composed the epic. But there is, too, a constant flow of fantastic imagery; not for nothing is the tilism’s name drawn from the words for “senses” (hosh) and “ravishing” (ruba). Often, magic is instantiated in seemingly mundane items: “Sorcerers from both sides recited spells and exchanged magic citrons and limes, magic steel balls, clusters of arrows and needles, and garlands of chillies” (168). There are silver forests, rivers of blood, gemstone mountains and crystal cities, and magic beasts of every kind, as suggested in the above quote. There are magic slaves of steel, on horseback, and sorceresses who live as lightning bolts. It’s noticeable that none of these are described with the elaboration brought to bear on the characters’ appearance or actions. None of them, in other words, are described in such a way as to make them vivid and exciting; they are simply stated with the assumption that they are exciting. And though each engagement between the tricksters and the sorcerers follows the same template – Afrasiyab calls up his latest minion (sometimes with an army, sometimes without); Ayyar or one of the other tricksters uses their skill at disguise (using magic paints and lotions) to lull said villain into a trap, at which point they use an egg of oblivion to render them unconscious, and either cut off their head, or stick a needle through their tongue to prevent spell-casting and convert them to the True Faith – over this template many elaborate variations are laid, to the point where the frantic complexity of some of the later episodes approaches farce. This sorcerer will set up a magic slave to shout out the true name of anyone who approaches; that sorcerer will reveal true faces in a magic mirror; another sorcereress will use magic water to prepare the ground in such a way as to render the tricksters unconscious; or Afrasiyab will consult the Book of Sameri, which reveals the truth of whatever is passing. (Once the existence of this tome is revealed, you do wonder why he ever does anything without consulting it first, however.) Sometimes one or more tricksters will be captured, only to be rescued by their companions before the coup-de-grace. At other times there will be a pitched battle between Afrasiyab’s latest army and whoever is on the rebel side at that point. Some characters, inevitably, do survive, and over the course of the book a substantial cast accumulates on both sides. On the rebel side the most notable is probably the sorceress Mahrukh Magic-Eye, mother of Prince Asad’s love, while on Afrasiyab’s side the most entertaining are certainly the five “beautiful, adolescent” trickster girls. Amar Ayyar and his colleagues immediately fall in love, and try to steal kisses from their beloveds; “the trickster girls,” we are told, “would let them come close then bite them” (214). The minxes. 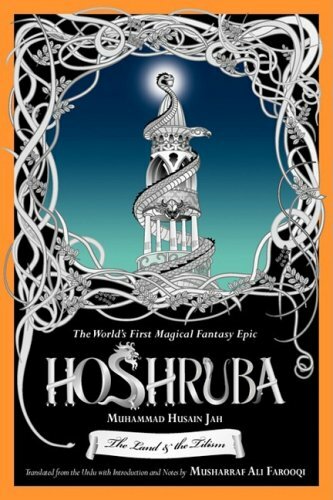 As Anil Menon notes in his review, to allow the claim that the cover and website make for Hoshruba as “the world’s first magical fantasy epic” requires some contortion. But it does have a lot of the tropes – the quest, the secondary world, the dark lord – and in one crucial respect it is absolutely of a piece with the modern genre: this volume isn’t even close to being complete in itself. In fact, because Hoshruba – for all its frustrations, repetitions, and inconsistencies – is never less than engaging, when it does simply stop, even though we were forewarned, it’s a bit of a shock. You emerge, blinking, back into the world, because the truth of Hoshruba is that, like all good fantasies, it is itself a tilism: it infuses these inanimate pages with magic. It may be a while before I feel ready to tackle volume two but it is, in the end, a delight to be exhausted. Once I’m finished _Journey to the West_ and _The Tale of Genji_ . . . I’m all over this! Kate, don’t forget _The Romance of the Three Kingdoms_ and _The Water Margin_. David, no, really, I am literally in the middle (well, averaged; last quarter & first quarter) of those too. Granted I have been most of the way done with _Genji_ for a couple of years now . . .
Saif the Ambidextrous presumably dual-wields, which is pretty awesome. Hell of a lot better than whirling a shield, in fact. Anyway, i’m just going to wait for the MMORPG.